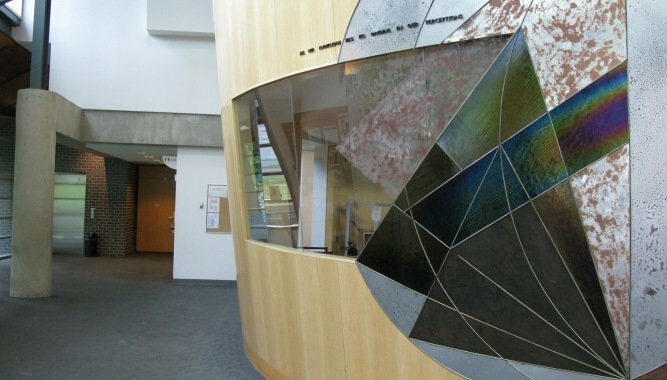 Abstract mural made of three circles and several geometric forms. A quote from Leonardo da Vinci appears at the top. Our perception is defined as the process by which the sensory stimulation gained through sight, sound, smell, taste, feel and movement is translated into an understandable experience. Challenges the viewer's perceptions by making references to the mysteries of the mind and of the universe, and to the search for truth. "A library is an ordered resource for accessing information to further one's knowledge and to enhance one's learning. The route taken to that information can guide the thought process and determine the end conclusions. Leonardo realized this a few centuries ago; Our concept is to challenge users of the facility to rethink their thought processes. 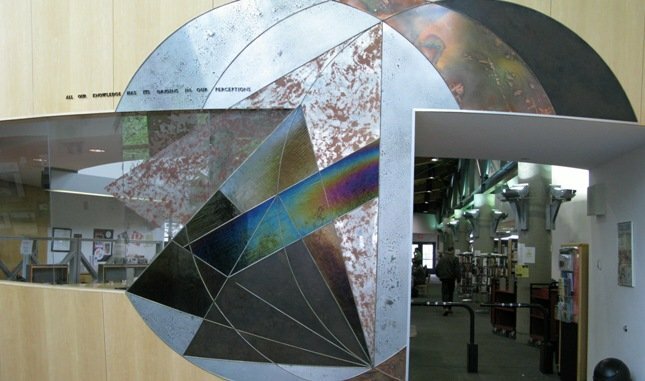 The most opportune time to accomplish this is before entering the Library - confronting the viewer by having them walk through the piece - and perhaps encouraging them to leave their previous perceptions at the door. The format in presenting the concept is another Leonardo da Vinci exercise - a geometric discovery of form, mathematics and order. Our interpretation of the exercise challenges the viewer's perceptions: first, by engaging the individual in a visual puzzle that defines the various elements of the geometry in a manner that also juggles their perceptions; and secondly, by making visual references to the cosmos that will take the viewer beyond the physical piece to consider the mysteries of the mind, universe, and of course, the search for truth. 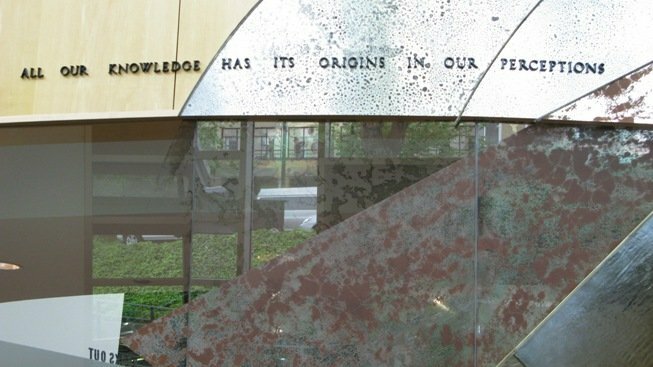 In locating the piece at, and as the entrance, it emphasizes Public Art as a functioning component of life and architecture - the concept challenging one's thought process and the physical statement aiding in the flow and function of the ordered architecture." Source: City of Vancouver (2008). Public Art Registry.